(330 x 305 x 254 mm) and uses the SEAS L26RO4Y long throw woofer, which is the same driver as used for LXstudio and LX521. Two LXsub2 woofers add articulate deep bass and rendering of spatial dimension to the LXmini speakers. LXmini+2 is a 3-way loudspeaker that combines the LXmini with two, compact LXsub2 dipole woofers. LXmini+2 is a speaker that is on par with the LX521.4 in terms of frequency range, clarity, imaging, sound stage size and disappearance, albeit at lower maximum sound levels and particularly in the deep bass. The system is flexible in room placement and woofer setup, providing highly satisfying and enjoyable rendering of stereo recordings. Compared to the LXstudio the LXmini+2 has the same low frequency response but it rolls off more steeply below 20 Hz to attenuate undesired subsonic signals. Due to the compact open baffle design and the fact that only two instead of four 10" drivers are used, the acoustic output is about 10 dB less than from the LXsub4 woofer of the LXstudio. This means that the LXsub2 has to be driven 10 dB harder, i.e. 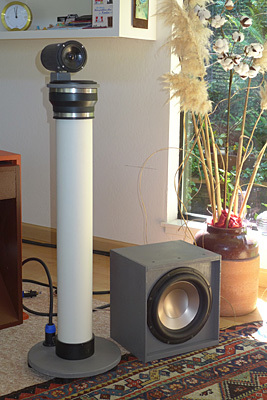 the cone excursions have to be about three times larger for the same SPL as from the LXsub4. When using a 200 W/channel power amplifier this can lead to damaging excursions of the 10" driver at very low frequencies. So caution is advised. A 50 W amplifier is much safer to use and likely to clip before the driver will. But it will also not allow for maximum excursion at 60 Hz. In my system I use two channels of an AT1806 (180 W/ch) to drive the LXsub2, and start with a low volume level for playback of an unfamiliar recording, before turning up the volume and watching the driver cone for over-excursions, which also announce themselves as severe distortion. When operated with care the LXmini+2 can handle any program material at enjoyable SPL.